We have been asked to assist the Blue Cross in rehoming this lovely lad. Arnie is a lovely 7yr old liver and white male, he, is docked chipped and vaccinated. The beautiful Arnie is on the search for a new home with active owners who enjoy exploring and walking. He loves to play and likes to have rope toys to run about with. He can initially be a little nervous of new people and visitors to the home but once he knows you’re his friend he will adore you. He loves attention so would benefit from a home where he won’t be left for too long, he also enjoys the company of other dogs so could be happy living with the right one. He is an absolute pleasure to be around and will make a fantastic addition to most homes. If you are interested please click on the link below for more information, or contact the Blue Cross in thirst and ask for Rachel mentioning you have seen him on our site. 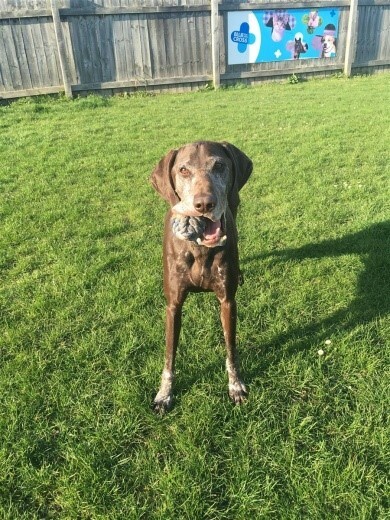 Our aim is to help and advise on the German Shorthaired Pointer breed and we are very proud to have rescued & re-homed GSP's within mainland Britain for the last 30 years.